Old barns can be converted into amazing homes. Some people like to hang works of art on their walls; others like to live in them. 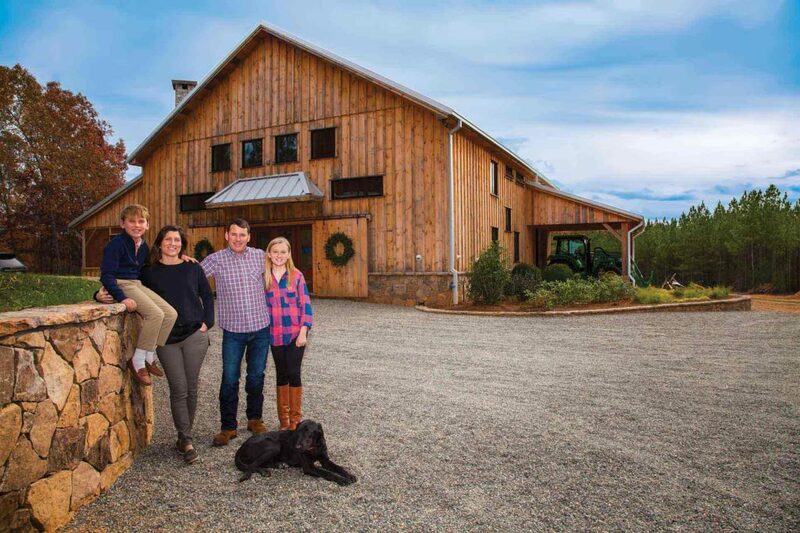 Charlotte, North Carolina, golf course developer Joe Dan Downey had never seen a barn home in person, but one night, at three o’clock in the morning, a vision of building one to use as a hunting lodge for his family popped into his head. 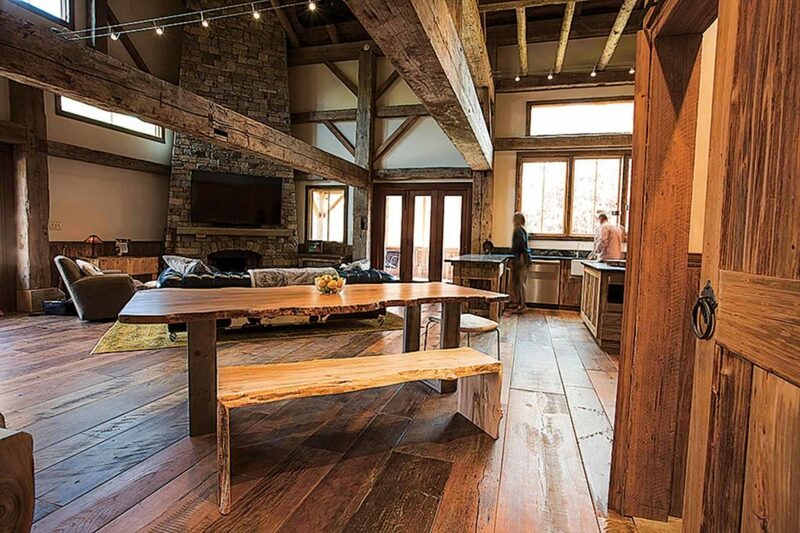 This provided the spark that led wife Kristin and him to build Ranger’s Lodge, a striking 40-by-52-foot converted historic barn on the 600-acre property the Downeys had purchased near Union, South Carolina. Its rolling hills, ponds, and forested areas are great wildlife habitat and so it’s an ideal place to hunt deer, turkey, quail, and ducks. Barn homes are dwellings that are built in either a barn style, or have been converted from an actual barn. Typically they are constructed using a post and beam method, where a horizontal beam is supported by two vertical ones. They have vast open spaces with soaring cathedral-style ceilings. And no, they do not still smell like a barn! The Downeys’ lodge is a converted barn that had stood outside of Blackstock, Ontario, from about 1850 until 2015. It was dismantled and moved 900 miles south where it was rebuilt on his property. It was finished just in time for the Downey family’s Thanksgiving dinner in November 2016. 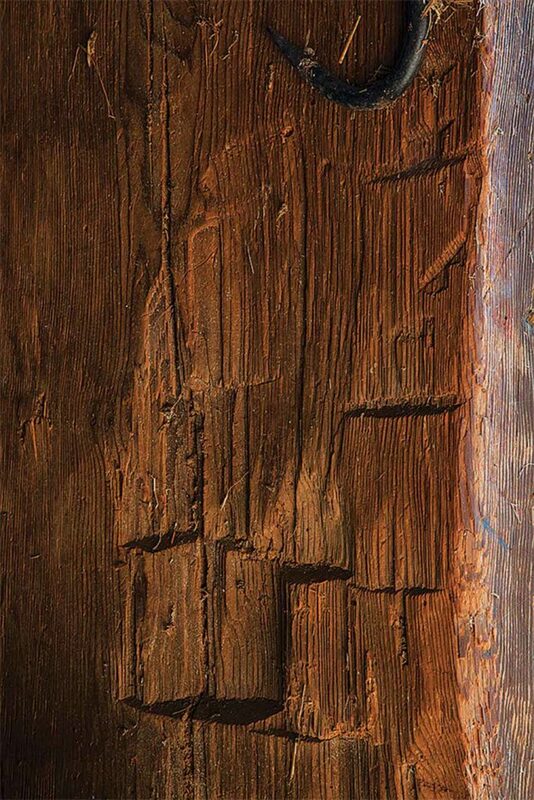 Every adze mark the builder made can be seen in the beams. Antique wood has become a big business in North America. Lehmer estimates that the market was only worth a few million dollars when he started taking down barns in the 1970s. Today though, used lumber has become a billion-dollar business. Wood is now being reclaimed from old barns, factories, mills, and wherever else it can be found. Lehmer showed the Downeys a few complete barn kits he had available from Ontario before they settled on the one from Blackstock. The barn had been sourced and dismantled by Gary Edwards, a barn home contractor from Uxbridge, Ontario, who’s collaborated with Lehmer for over 15 years. Builders pinned the beams together in barn frames throughout the 19th century using the age-old mortise and tenon technique. A mortise (hole) was hollowed out in one piece and a correspondingly sized tenon (tongue) carved in another. The tenon is then inserted into the mortise and locked into place with a pin. While someone taking down a barn today could tear them apart with a chainsaw, they retain much more value if the pins are carefully popped out and the beams stay intact. 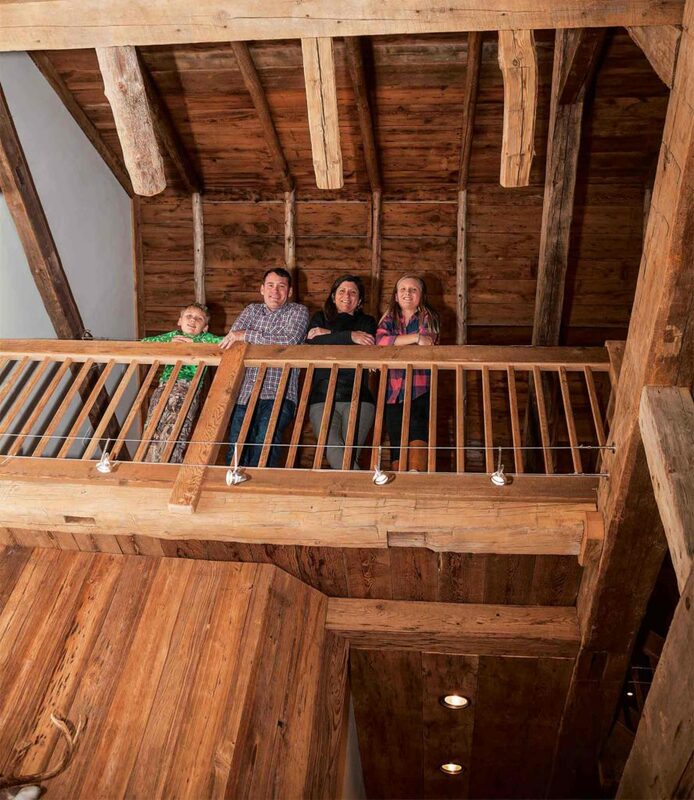 The Downeys’ barn house has a rustic, homey feel. It can take several weeks to dismantle a barn. Each piece has to be labeled and tagged to show where it was placed and how it was used. Then Lehmer takes them back to his shop where the beams are cleaned, repaired, and dryfitted. That way his crew can quickly reassemble the barn frame with a crane after it’s trucked to it’s new home. He sources twenty barns from Canada for every one he gets from the United States for three main reasons. First they often used 12-by-12-inch beams in Canada; American barns are usually not that big, often around the 8-by-10-inch size. Second, Canadian barns tend to have higher sidewalls. A Pennsylvanian barn normally has 14 to 15 feet, while it’s not uncommon to find barns from Ontario with 16 to 19 foot walls. This makes it much easier if you want to include a second story or a loft as part of a barn conversion home. Finally, 19th century Canadian barn builders often include a swing beam in their barn design. These impressive slightly arched beams, often 22 inches or more tall and 12 inches across, stretched across the middle of barn. They acted as a main support beam to hold up the second floor. The open space below was used to thresh grain by walking horses over it in a circle. It was also good for storing equipment. Today they’re used to create jaw dropping design features in barn homes. Canadians could view the number of barns heading south as a bad thing because without a doubt the country is losing little pieces of its history. But on the other hand, they are losing them anyway. Untold numbers of barns have been burnt, torn down, or have quietly fallen into ruin. The master bedroom is in an open loft that overlooks the kitchen and great room. Lehmer’s crew came in and set up the Downeys’ barn frame in about a week. It was completely enclosed against the elements using structural panels with six inch foam insulation within three. The Downeys found it easier to envision an interior layout design once they reached that stage. 30 feet long) that stretches across the great room. Every adze mark the builder made when he hewed out the beams is clearly visible. It’s such a tactile surface it practically demands to be touched. Next, there is the 45-foot-tall Pennsylvania-style stone fireplace, built from North Carolina stone, rising with straight, crisp lines up to the ceiling in one corner. It’s Kristin’s favorite feature. The master bedroom, Joe Dan’s favorite feature, overlooks the kitchen and the great room from an open loft. A sunken en-suite master bathroom, a feature that was suggested by Lehmer, is accessed by a set of stairs set off to one side. The kitchen has a soapstone counter that we sourced in Charlotte, Joe Dan says. The floors are antique hardwoods that came from a historical flooring company in Johnson City, Tennessee. Daniel McCluskey Jr., a custom woodworker who works with Dale made the trifold door out to the screened patio and entrance door out of antique mahogany panels. “They’re truly amazing,” says Joe Dan. While Lehmer’s crew did some of the key features, the Downeys used local contractors for the conventional framing, plumbing, electric, heating, and air conditioning. The couple said this stage became a painfully slow going process because while the contractors did good work, their barn house was very different than any projects they had done before. It took a lot of time and patience to get them to understand that they wanted something unique. The Downeys spent Thanksgiving at their barn home, Rangers Lodge. He says if you really watched your costs you could put one up for as little as $150 (U.S. dollars) per square foot, but realistically you are likely going to be looking at closer to $200. However if you want to have a lot of stone work, Pella windows, and a Viking stove, you could quickly find yourself in the $300 per square foot range or higher. Home features. After that, give some thought to what features are important to you. Do you want a big great room that flows into your kitchen, or do you want more private rooms? How many bedrooms and bathrooms do you want? If money is an issue, which it is for most of Lehmer’s clients, you could use a smaller barn for your great room and kitchen and then put on shed additions with conventional lumber to keep your costs down. Lee Reich has something to say about tilling your garden: Don’t do it. This is where country music was born, and the people here play it as passionately as ever.